Carrots are a fantastic way to get Vitamin A and antioxidants such as beta-carotene into your diet. Carrots are also a good source of vitamin K, vitamin C, vitamin E, several of the B vitamins, important minerals and nutrients such as potassium, manganese, phosphorus, folate, and dietary fiber. Many people enjoy drinking carrot juice by itself, and is without a doubt one of the top sellers of fresh juice sold in supermarkets. 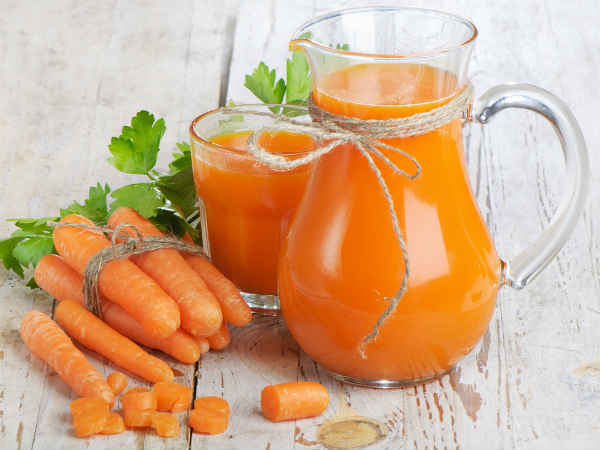 However, because of how relatively inexpensive carrots are, and how they compliment so many different popular juicing ingredients, they are also one of the most popular vegetables for home juicer recipes. Carrots do a great job of adding sweetness to any juice recipe but do a particularly good job of masking stronger tasting green vegetables. For this fact alone, they are a key ingredient in many popular “green juice” type or 100% vegetable based recipes. 2. Chop the carrots if necessary depending on your juicer. This should make around 10oz or a full glass of tasty carrot juice. *Tip – add the spinach to your juicer first, then add carrots afterwards to help push out all the spinach juice.